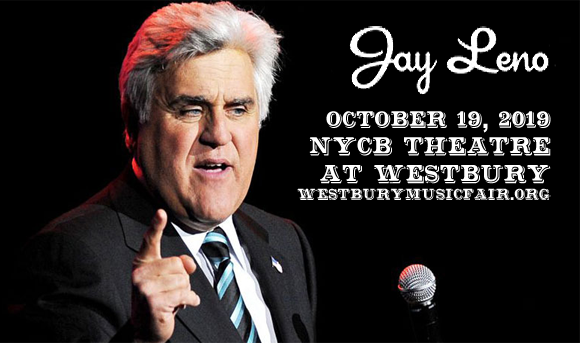 Jay Leno comes to NYCB Theatre at Westbury on Saturday 19th October 2019 on a brand new tour! The former Tonight Show host, who has spent his recent years presenting the Emmy-winning series Jay Leno's Garage, is back on the stage and ready to get stuck in to some seriously funny stand-up! The hilarious comedian, who has influenced a whole generation of comics, knocks 'em dead every time and with brand new material up his sleeve, folks won't know what hit 'em! American comedian, actor, writer, producer, and television host Jay Leno began his career as a stand-up comic and actor in the 1970s, appearing in minor roles in several television series and films. Leno's first appearance on The Tonight Show was in 1977, performing a comedy routine. Nine years later, Leno became a regular stand-in for The Tonight Show's presenter Jonny Carson, and in 1992 he replaced Carson as host. Leno hosted The Tonight Show until 2009, going on to host his own primetime talk show, titled The Jay Leno Show, which aired weeknights on ABC. The Jay Leno Show was cancelled in January 2010 and Leno returned to host The Tonight Show until February 2014. That year, he was inducted into the Television Hall of Fame and began hosting Jay Leno's Garage, which he still currently hosts.